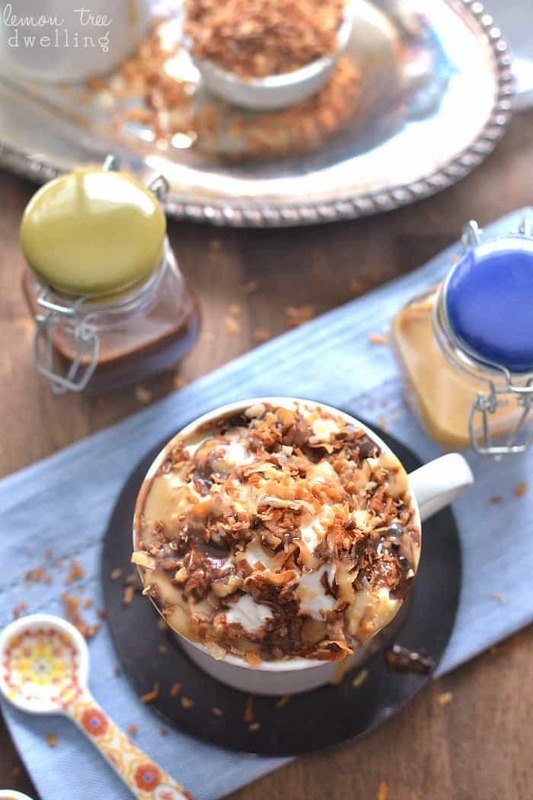 Skinny Samoa Hot Chocolate is a delicious hot drink that is so rich and creamy you won’t know its healthier for you! The perfect way to indulge….without any of the guilt! I don’t know about you, but I think it might be time for a Bachelor update! Are you watching? Did you see the 3-in-a-row marathon? Do you have any thoughts? I’ll keep the specifics to a minimum, since I’m sure many of you have no idea what I’m talking about…..but I can’t help myself! The Bachelor must be discussed! It’s funny. Every new season I tell myself I think I might be getting too old for The Bachelor. But every new season I keep watching….and sooner or later I realize that age doesn’t matter when it comes to indulgence. Because indulgence is not about making sense. It’s about treating yourself to something you totally don’t need…..but just really want! 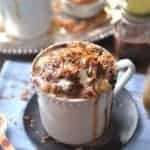 Skinny Samoa Hot Chocolate – Heaven in a glass! I am definitely fully indulging in The Bachelor this season and having no regrets about it. When it comes to sweet treats, though, the whole “no regrets” thing isn’t as easy to come by. Of course I still want to indulge, but it can’t be at the expense of everything else! 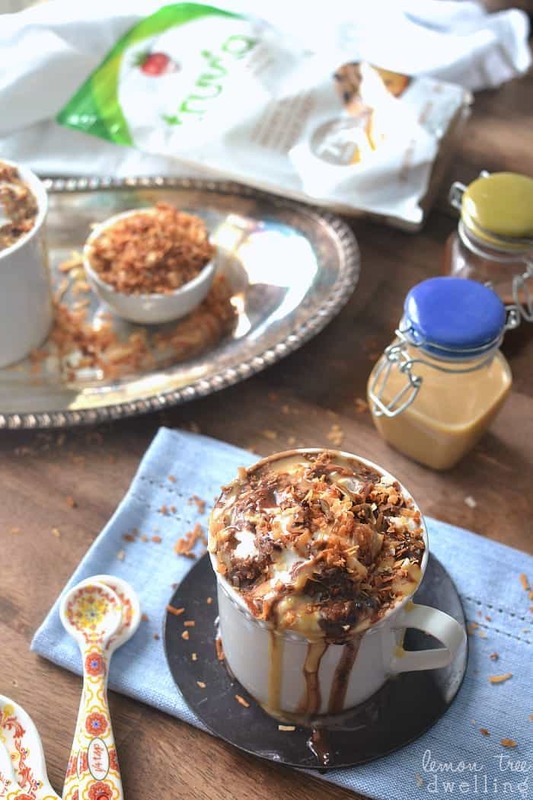 Which is why this Skinny Samoa Hot Chocolate made with Truvia® is my new best friend. Not only is it skinny…..but it’s absolutely delicious! 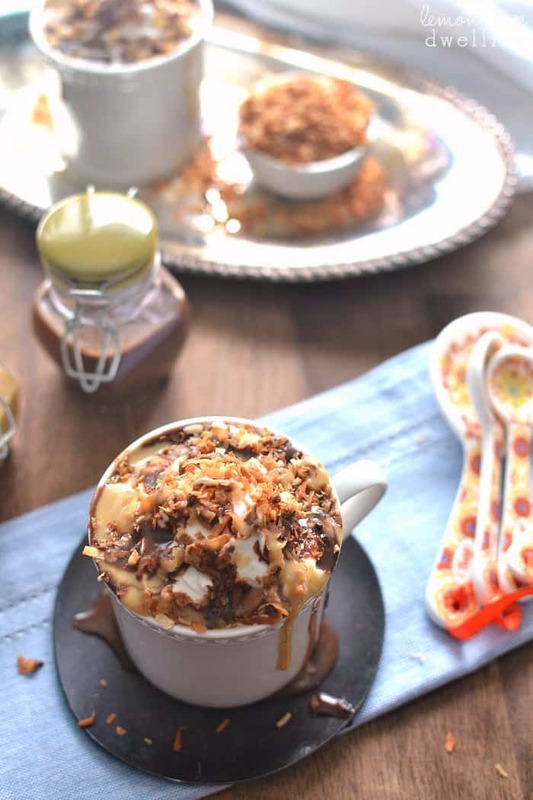 So you can treat yourself to a Skinny Samoa Hot Chocolate and never give it a second thought. Which really frees you up to give more time and attention to The Bachelor……or then again, maybe not! In a medium saucepan, combine chocolate chips, Truvia, and 1/2 c. milk. Cook and stir over medium heat until mixture just begins to boil. Stir in remaining milk; heat through. Combine Truvia and cocoa powder in a small saucepan. Stir in evaporated milk and butter. Heat, stirring, until mixture begins to thicken and bubble up. Combine Truvia and evaporated milk in a small saucepan. Remove from heat; stir in vanilla and kosher salt. Spread coconut on a rimmed baking sheet. Toast in a 350 degree oven, stirring occasionally, 10 minutes or until deep golden brown. Divide hot chocolate evenly among 4 heat-proof cups. 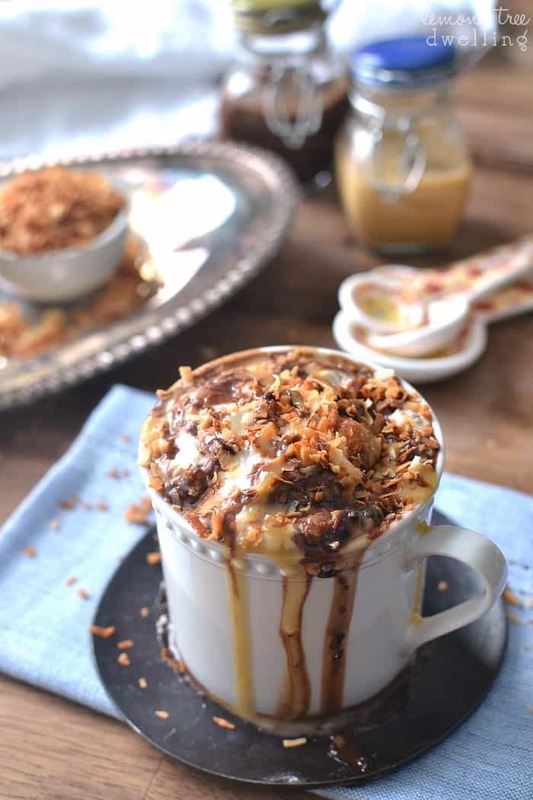 Top with whipped cream and toasted coconut, to taste. Drizzle generously with chocolate sauce and caramel sauce. For another great sweet treat using Truvia® try my Strawberry Lemon Cheesecake Bites! Yum! 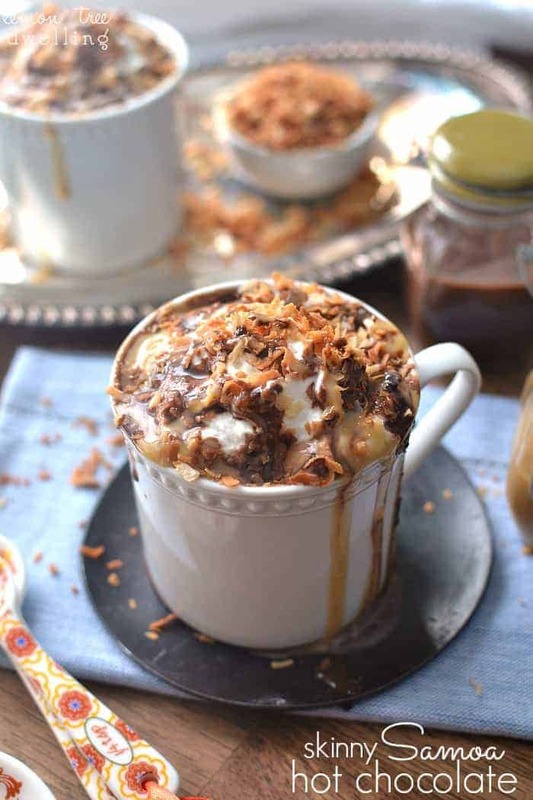 We are always searching for warm up recipes these days so this would be perfect! I love the flavors and the fact that its skinny helps! I will def be checking out that truvia contest too! As for the Bachelor, I do like Kaitlyn most out of the remaining. Becca was my fave but I don’t think she’s ready for that major commitment in life. I am anxious for the Women Tell All episode too :)! Wow I could totally go for a mug of this hot chocolate right about now, Cathy! This looks amazing! And I’m loving that it’s skinny too. Such a wonderful drink! Mmmm… This looks so good and indulgent! Seriously, this could easily become my favorite drink! Unbelievable!! I need this in my life and immediately!